Comics Experience Blog: COMMUNITY NEWS: Douek on Graphicly, Sergi on Comics Law, and Groah talks DoubleFeature! COMMUNITY NEWS: Douek on Graphicly, Sergi on Comics Law, and Groah talks DoubleFeature! We're had LOTS of news this week from the Comics Experience community, and we wanted to share three more items as we enter the weekend! Comics Experience alum and Creators Workshop member, Rich Douek's comic book Gutter Magic has been released on Graphicly. 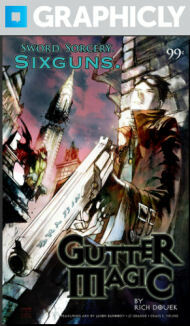 The Gutter Magic one-shot tells a tale of sword, sorcery and sixguns in three interconnected tales of an alternate history where a magic-fueled World War II drove the world to the brink of apocalypse. The book features art by Craig S. Yeung, Jason Baroody, and JC Grande, along with colors by Paul Little and lettering by Creators Workshop member E.T. Dollman! Gutter Magic One-Shot on Graphicly! Comics Experience alum and Creators Workshop member, Joe Sergi, also happens to be a Legal Eagle, and in the past has appeared on various podcasts and shows discussing law cases related to comics. So, it's no big surprise that Joe recently appeared on the Comic Geek Speak podcast to chat about two cases very much in the news -- the Robert Kirkman/Tony Moore contract dispute over The Walking Dead, and the Marvel Comics/Gary Friedrich suit related to Ghost Rider. We've previously talked about Creators Workshop member Joey Groah's podcast, In Production. In each episode, Joey has "conversations with people making things," whether it's origin story, process, workflow, or the overall business of being creative. And in Episode 19, Joey had an in-depth chat about DoubleFeature Comics with Four Star Studios members Sean Dove, Josh Emmons, Mike Norton, and Tim Seeley. You can hear about how these guys got together and began putting out digital comics by top creators for 99 cents.